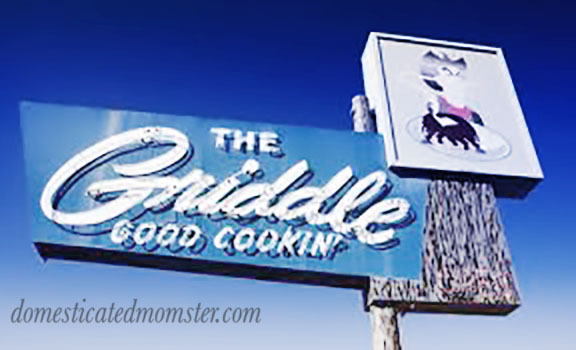 If you are ever in the area of Northern Nevada on I-80, between Reno and Elko, may I suggest that you stop for a bite to eat at “The Griddle”. But only if it’s between the hours of 6am and 2pm (PST)…because they are just that good that they aren’t like the rest of Nevada where everything is at your fingertips 24 hours a day. The decor is like the rest of this town…a little outdated. 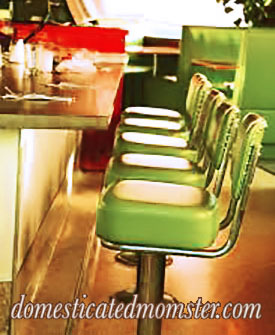 And when you first walk in, the first thing you will probably notice are the bright green colored upholstery on all the booth and breakfast counter chairs. I am talking 70’s, one shade away from, neon green….green. You will also notice that the place is packed. No one cares about the antiquated decor because they are too busy enjoying the delicious food. They have classic french toast, almond crusted french toast, stuffed french toast, to name a few. There are raspberry crepes and peach crepes, and of course pecan crepes. 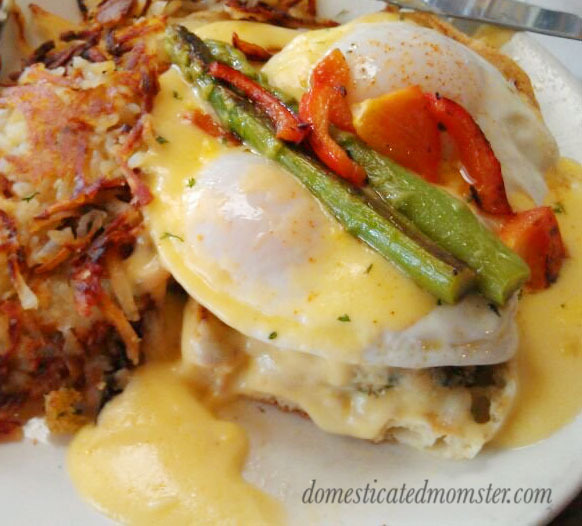 And if you like eggs, they come in a variety of ways including my ultimate favorite “The California Eggs Benedict”. The Hollandaise sauce is so good you won’t want to leave a drop of it on your plate. They also squeeze the orange juice from fresh and have an assortment of salsas and jams that you can taste and purchase to take with you! All homemade! For a complete menu click here. The Griddle is located right on the main road of Winnemucca Blvd. You can get to it from any exit off of the I-80. So remember if you are passing through or have stayed overnight here and wondering where there is a great place to get breakfast or brunch, try “The Griddle”. It also has a patio in the warmer months to sit out on and it’s very kid and big party friendly. I promise, you won’t be disappointed. Love the decor at this place! Sounds delicious too. I like retro too! But some people don’t dig it. They have a tendency to think that outdated means bad food too. But it’s quite the opposite. The weather here is very short “patio” time. In the summer it’s hot unless you get there early in the morning. For me, early is 8am lol. Thank you for linking up again for #foodpornthursdays. Thank you for linking up! Yes diners are definitely a great place for good food! I have never been anywhere in the UK…it’s on my bucket list…just not sure where I want to go….yet ;o) Thanks so much for linking up with #foodpornthursdays! For our small-town it is one of the best places to eat! This place sounds amazing and I wish we had them in the UK!!!! Apparently there is a small chain of them. But no, none in the UK. Although I am sure you have lots of great foodie places in the UK. I love breakfast any time of day, and the old diner style restaurants seem to be the best places. Looks like it was fun as well as tasty! Yes we always love the vibe there. Great place for our little town.